Beginning July 1, dining out in the state of Virginia will get a little more personal for wine enthusiasts as restaurants can legally allow customers to bring their own wine (BYOW) – also known as plain ‘ol corkage in some parts. For context, Corkage is what restaurants call the fee they charge to open and serve a bottle of wine or hard cider customers bring with them. (Check out Jim Raper’s excellent piece in The Virginia-Pilot for thoughts from industry professionals on the new BYOW legislation). The subject of corkage has been a hot topic of discussion since the bill made it’s way through the Virginia General Assembly. I recently served as a judge in the annual Virginia Wine Lover Magazine competition along with several Sommeliers and restaurant owners, and BYOW was the most discussed topic of the day (aside from the wine of course). Here in the Virginia Beach/Norfolk area, the corkage fees will range from $10 – $35 for restaurants that participate. In speaking with a couple sommeliers and restaurant folks in Charlottesville and Northern, VA, the corkage fee range seems to be closer to $25 – $35, higher in a few restaurants closer to DC. It’s worth noting that restaurants are not obligated to allow guests to bring wine. A restaurant’s decision to allow BYOW is based on a number of factors like clientele, wine list, overhead, and food price points. Several Sommeliers I spoke with expressed concern about the potential revenue impact if too many diners opt for BYOW, especially those customers that would normally purchase a bottle or two of higher priced wine. The numbers could certainly end up working against some restaurants if enough of their clientele bring their own wine. Conversely, the new BYOW could also bring in a few more customers as well. Interestingly, a couple of the Somms also noted pre-corkage jitters about their guests’ familiarity with BYOW protocols and etiquette. I have faith in the dinning masses that may be exposed to the freedoms of BYOW for the first time. Just in case… The etiquette points below are simply intended to provide general guidance for those who may be new to the wonderful world of corkage. Some of the tips below are pretty obvious, and of course optional, but the first point is the most important. One of the most important guiding principles of BYOW is calling the restaurant prior to your visit to ask about corkage policies including bottle limits, corkage cost, special handling your wine may need (i.e. – decanter, etc. ), and most importantly to make sure the restaurant actually allows BYOW. Yes, even if your best friend was just there last week, or their website outlines their policy, you should still call just in case. Enjoying a bottle from your personal collection at a restaurant is a privilege (despite what some may think). As an expression of deference and thanks, always offer a taste to the Sommelier. Even if the Sommelier (or server) declines, they will appreciate the gesture. Being thrifty is admirable, especially in the current and ongoing economic malaise, but corkage night at your local fine dining establishment is not the ideal time to show off your frugal ways. Bringing a bottle of really cheap wine like Yellow Tail or another grocery store staple can reasonably be construed as disrespectful to the restaurant. You can have that bottle of Charles Shaw Chardonnay any night at home; bring a special bottle to BYOW night. If you insist on eschewing good taste by bringing a cheap bottle, at least remove the grocery store price tag from the bottle before coming in to the restaurant. Don’t take advantage of a restaurant’s participation in BYOW. A generally accepted practice is to limit the number of bottles your party brings to the restaurant to two. Many restaurants will limit the number of bottles they allow guests to bring to two as well, so another reason to call ahead. I’ve found it good form to order at least one bottle of wine from the restaurants list to accompany the bottle you bring with you. Not only does this show good will and a nod to the restaurant’s list, I’ve found that many restaurant will actually waive the corkage fee for the bottle that I brought with me. Avoid brining a wine that is on the restaurants wine list. Most restaurants prohibit this, so it’s a good idea to check the wine list on the restaurants website or call ahead. 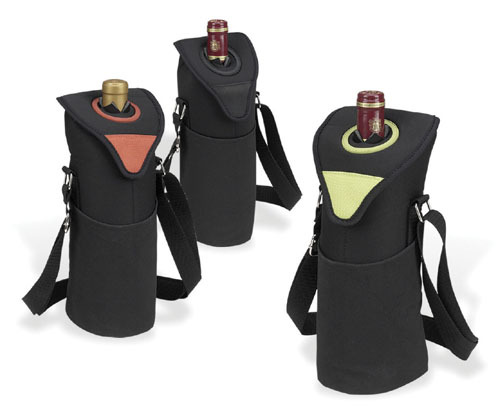 Another obvious one here – carry your wine to the restaurant in a protective wine carrier. The paper or plastic bag from the wine shop does not qualify as a protective wine transporter. For Virginia wine and hard cider lovers, BYOW is a great chance to showcase a few of your favorite Virginia wines or ciders that may not have otherwise had a chance of crossing the threshold to your favorite restaurant. BYOW will also prove to be a great way to introduce a few Sommeliers to the wines of their home state, some of which have likely only tried the larger Virginia producers. Get out there at BYOB on July 1. * As noted above, these are just a few of the more obvious BYOW etiquette tips. If I’ve missed one (or a few), please leave a comment below. BYOW can be a great blessing or a great disappointment depending on how it is handled, so this is a great piece Frank. Having been around in Niagara when this became legal as well it was interesting to see what some restaurants did, and many made it a very successful program. I agree that you should aim to get some wine from their list as well. Another key point is the gratuity. It is not fair to only tip on what is presented on the bill. The server / somm has the same about of table service for your bottle that you bring in. The cost of you bottle should be doubled / tripled to understand what it’s true cost would be in a restaurant and that is what your tip should be based on. Free (or cheaper) weekday corkage – what hospitality industry doesn’t ask the question, “How can we drive business mid-week?” Well here is one way. Expensive ($50+) corkage on regular wines, but cheap ($10ish) on local wines – This shows local support and may get more people coming in the door, but it also deters people from bringing in a cheap “Yellowtail like” wine since it will cost $50.00 to open it. Charge $100.00 corkage. – This simply says, we are not doing corkage to make your bill cheaper, but it helps if you have a special occasion bottle that may be several hundred dollars on the list. I have never actually been charged this service. If you show up with a really cool wine and it is obvious that it is for something special then the Somm has often waived the charge. It is there to stop people from bringing in cheap wine. BYOW can be a great way to support your loyal patrons and support a local industry that has long been left out in the local movement. It will be interesting to see how it is taken and used by consumers. Thanks for your input on this topic Jordan. Good point on tipping – I left that off the list, but dinners should always make sure they appropriately tip the serving staff. I suspect we’ll see some pretty steep corkage fees to keep out the ‘riff raff’ bottles so to speak. I’m ok with this since it’s the restaurants choice of whether or not to allow corkage. I’m most likely to take a wine to my favorite sushi restaurant that only serves ice cold Albarino that always tastes as if it’s been open a month. Will be interesting to see how our restaurants approach BYOW!!! Will the law allow restaurants without liquor licenses to permit patrons to BYOW? This is a good question… of which I do not know the answer to. Always best to check with your local restaurant. Cheers! No. It is only applicable at ABC licensed restaraunts.